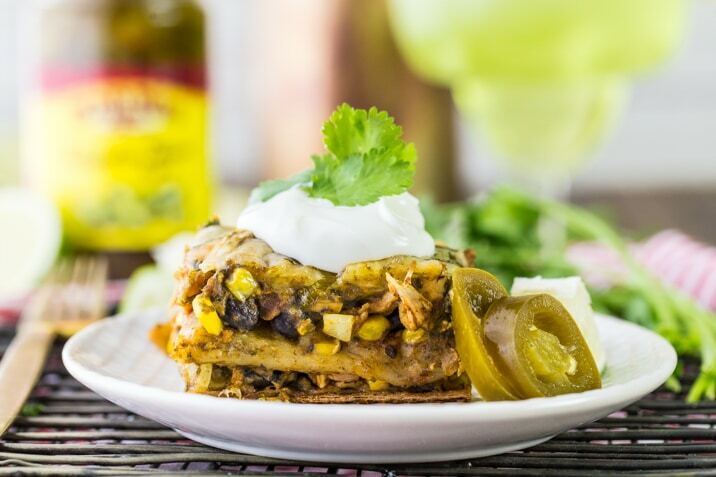 This Skinny(er) Chicken Mexican Lasagna Bake is relatively guilt-free and SO delicious! Perfect for a weeknight meal with the entire family. You can have all the flavors with less calories…feeling great about what you’re serving your family while still enjoying comfort food. Win win! If you guys follow me on Instagram, you know I had the awesome opportunity to go to San Diego in May with Old El Paso. Not only was it an amazing and fabulous good time (SO MUCH FOOD), I was also so honored to meet the other official Old El Paso partners and learn more about the brand. It really was the best two days, and I came back with so many ideas of how to use their delicious products. Tortillas, beans, jalapeños, enchilada sauce, taco seasoning, taco boats, the list goes on and on. Where to start?? After learning about their fresh ingredients, fun perspectives on Mexican food, and just completely falling in love with Old El Paso, I came home and stocked my pantry with almost every product I could find at the grocery store. 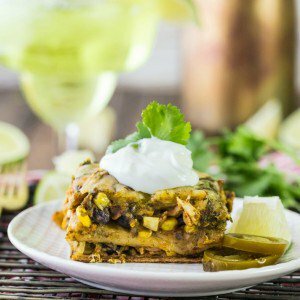 This Chicken Mexican Lasagna bake uses three of my favorites, their soft tortillas, jalapeños, and taco seasoning. 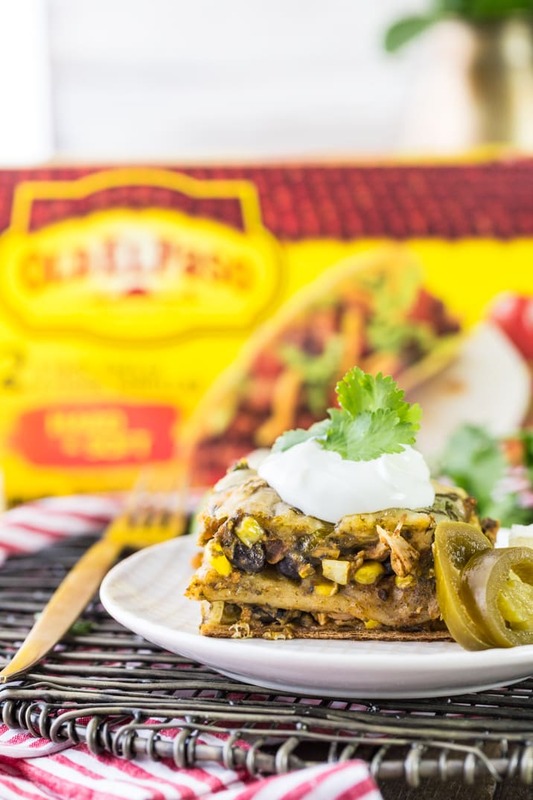 Mexican food is my ultimate weakness, so you guys are in for a treat as I try out more of their products throughout the year! 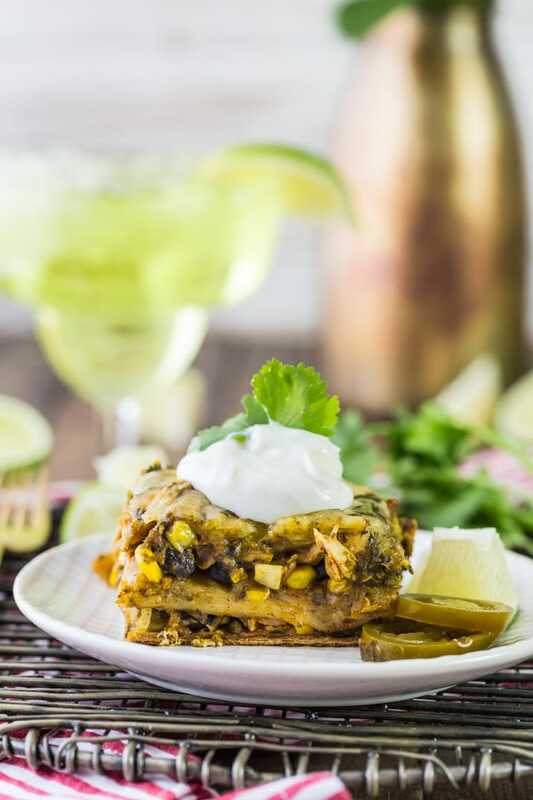 The best part of this Skinny(er) Chicken Mexican Lasagna Bake is that it’s deceptively healthy! I KNOW! It’s even got a secret ingredient in there to make you strong (SHH — IT’S SPINACH!). I topped it all with some plain greek yogurt, a great substitute when trying to make Mexican food a bit less caloric. You’ll never miss the sour cream! I have a feeling this easy meal will be made quite often at our house. 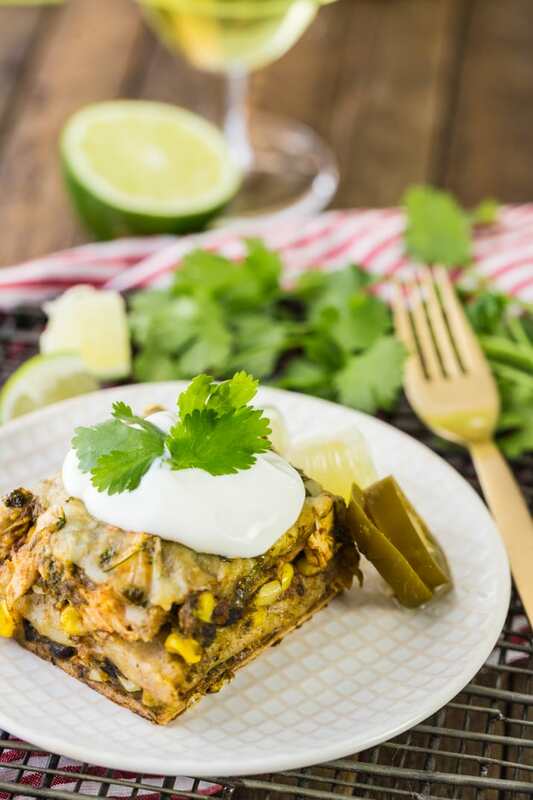 It’s the perfect quick and easy weeknight meal, and also a great option for making the night before and just heating up when you’re ready to chow down. And believe me, you’ll chow down. 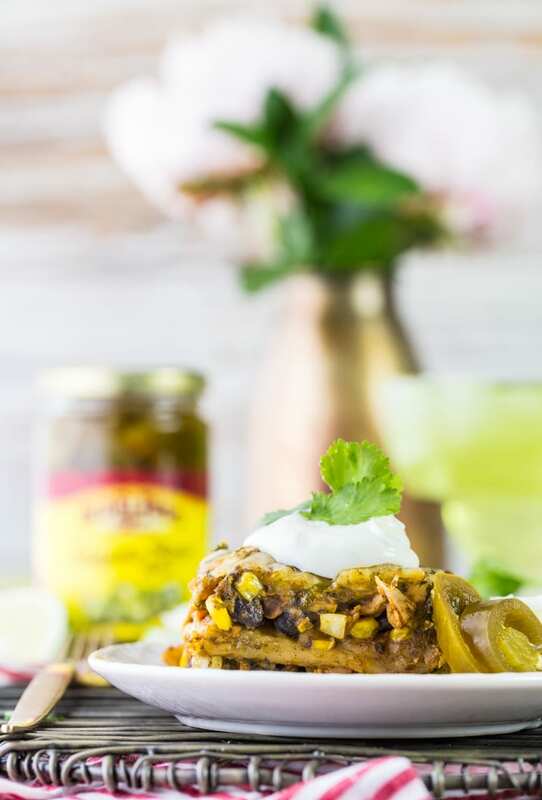 For more amazing recipes and fun recipe inspiration, be sure to go to Old El Paso’s blog. I’m blown away by people’s creativity, so many awesome ideas on that site. 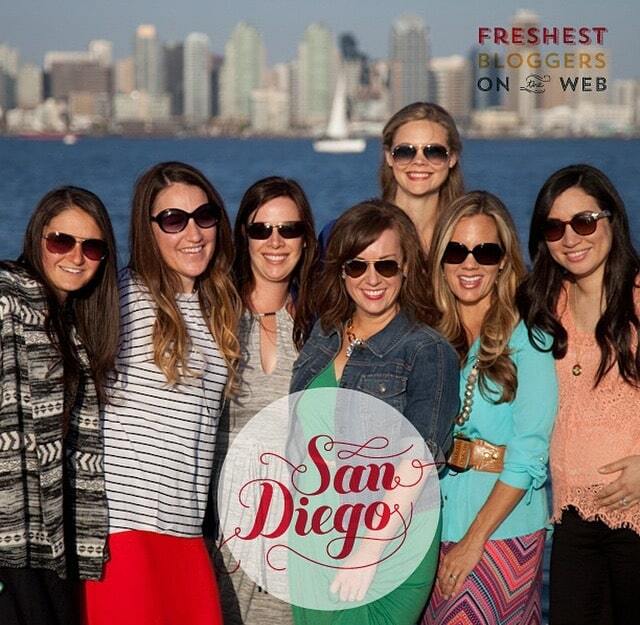 And if you want to see me being awkward on camera, check out the video below from my trip to San Diego, so fun! 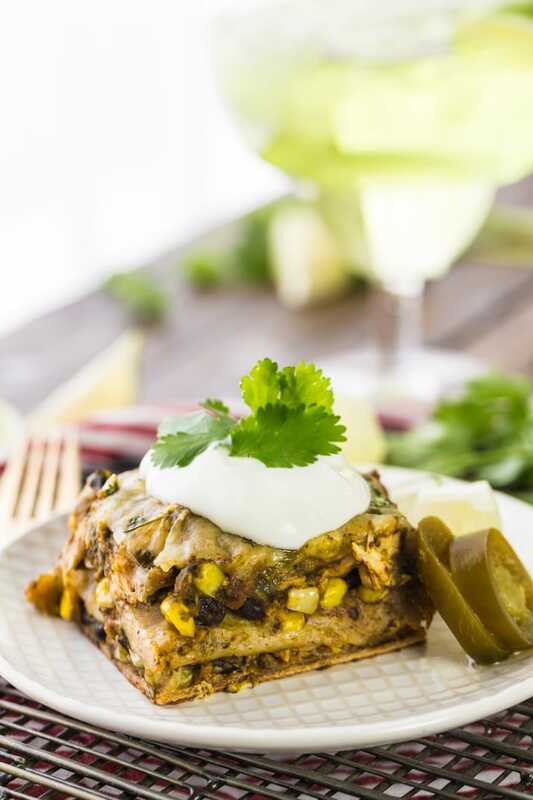 This Chicken Mexican Lasagna Bake is relatively guilt-free and SO delicious! 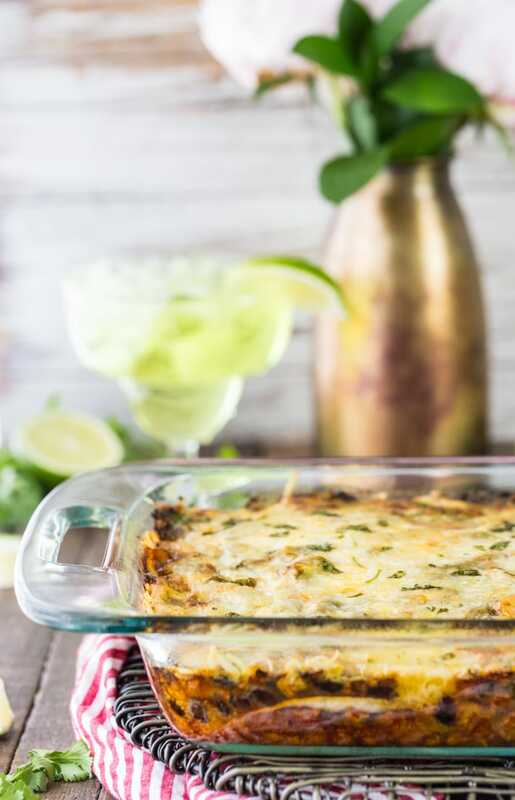 Perfect for a weeknight meal with the entire family. Spray a casserole dish with nonstick spray. In a medium-sized bowl, combine the taco seasoning with the chicken. Set aside. In a food processor or blender, combine spinach, cilantro, and salsa. Pulse until fully chopped and combined. Layer 6 tortillas into the bottom of your casserole dish, overlapping slightly. Cover with one cup cheese, the half of the beans, half of the corn, and half of the chicken. Take one cup of the spinach mixture and cover the chicken. On the second layer, start with tortillas, then beans, then corn, then chicken, and finally the spinach mixture. Top with the remaining cheese. Cover with foil and bake for 30 minutes until the cheese is bubbly. Remove foil and cook for another 10-15 minutes until the top is browned to your liking. 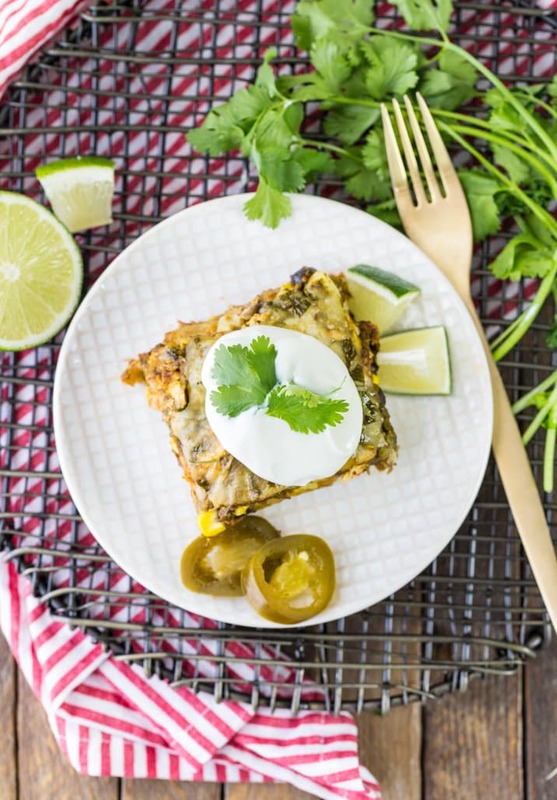 Serve warm topped with jalapenos, greek yogurt (or low-fat sour cream) and more cilantro. 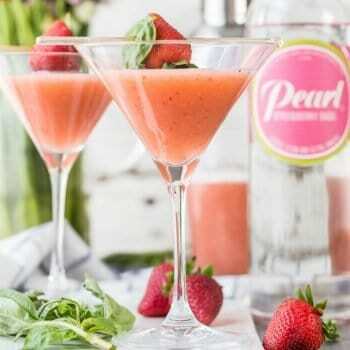 Do you know what the calorie content is per serving for this recipe? I’m sorry I don’t currently have a plugin/app to calculate nutritional info. I know personal apps like myfitnesspal.com seem to work well for people. Hope you enjoy the recipe! O.M.G. so glad I came across this one! I ran out of spinach (left it out) and don’t often have canned sauces – soooo… I used some Roasted Tomatillo Sauce (Pioneer Woman/Ree Drummond: http://www.foodnetwork.com/recipes/ree-drummond/roasted-tomatillo-sauce.html) in place of the salsa. Divided it into two casseroles so I can freeze one for later, (there are only two of us). 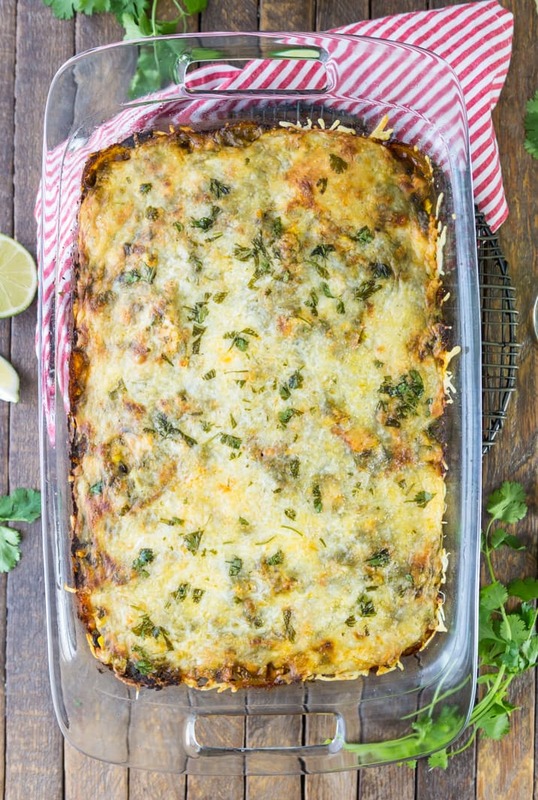 This one suits me perfectly: Healthy, Reasonable calorie count, and super flavorful! When I finish rehashing my site, will definitely give you and your site a shout out! Yay! Just love your substitutions…so smart! Sorry to say this was horrible. Born in Mexico and raised in Boyle Heights (East Los Angeles) this taste nothing close to authentic. It was dry and spinach, really? 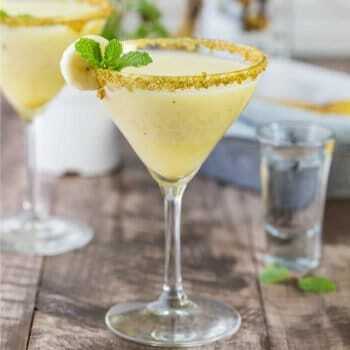 How is this a skinnyish recipe with nearly 7k calories per serving? Are those numbers right? Looking forward to trying it, but I’m baffled by the nutrition facts.